ROCKFORD, Ill. – The American Hockey League’s Rockford IceHogs today announced they have signed forward Justin Auger to a Professional Tryout (PTO) agreement. Auger, 24, has logged three points (1g, 2a) in six games with the ECHL’s Florida Everblades this season. The 6-6, 230-lbs forward has fired three or more shots on goal in each of his six contests with Florida, including a season-high six shots on Oct. 26 at Orlando, and totaled 24 shots on goal thus far during his ECHL stint. The Kitchener, Ontario native has spent each of the last four seasons at the AHL level with the Ontario Reign organization, helping the club reach the Calder Cup playoffs each year from 2014-18. Last season, Auger posted 25 points (11g, 14a) in 65 contests as an alternate captain with Ontario and earned his first NHL promotion on Oct. 17. The forward made his NHL debut with the Los Angeles Kings the following night against the Montreal Canadians and skated in two NHL contests during the 2017-18 campaign. 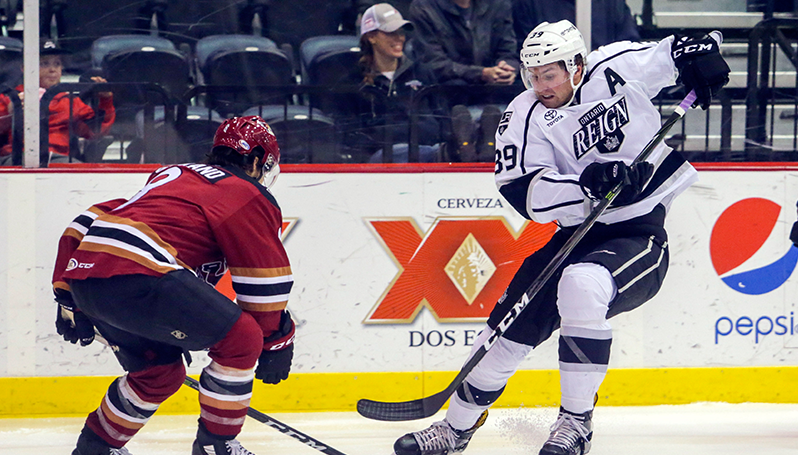 Overall, Auger has combined for 110 points (54g, 56a) and 213 penalty minutes in 264 career AHL games. He won the 2015 Calder Cup with the Reign (then Manchester), and has totaled 11 points (7g, 4a) in 41 career AHL playoff games with Ontario.